With only days to go before Christmas, goodwill toward men is in short supply in Washington as Democrats and Republicans blame each other for driving the country toward economic calamity. Gloom has settled over the prospect of reaching a deal to keep the country from diving off a fiscal cliff in 11 days when automatic tax increases and spending cuts start to kick in, increasing the chances of another recession. And why shouldn't pessimism reign? Negotiations between President Obama and Republican House Speaker John Boehner have broken down almost completely; the two men have not talked in days. Meanwhile, Boehner failed tonight to pass a fallback solution that the president threatened to veto and Senate Democrats rejected. Without enough Republican support to pass his Plan B bill, Boehner scuttled the vote and sent his members home for the Christmas holiday. So yeah, it’s not looking good as the country careens toward the cliff. But if politics is part theater -- and God knows there’s been plenty of choreographed drama this week -- then the House vote tonight marks the end of Act II with the all-important third act climax to come. There is still plenty of time, and opportunity, for Boehner and Obama to strike a deal. At first blush, Boehner’s decision to step away from the negotiating table to pass his own fiscal cliff solution seemed to give the White House talks short shrift. Frustrated with the maneuver, Democrats have scolded the speaker for wasting a week of negotiating time. But behind the rhetoric there was a strategy at play. The plan appeared designed to move Obama toward the speaker’s position of smaller tax increases and larger spending cuts while helping conservatives wrap their heads around the idea of voting for a tax hike. The speaker struggled to round up GOP votes for a package that only would have raised taxes on millionaires. If Boehner had trouble selling his own package, it sends a message to Obama that his position, raising taxes on people who make over $400,000, is going to be even tougher to pass. Amid rank-and-file House Republicans, there was growing opposition to the Boehner-Obama talks. If that feeling was allowed to fester, Boehner feared he would not be able to muster enough support for an eventual deal with Obama. Thursday’s vote was supposed to ensure that conservatives would have their fingerprints on any final result by bringing them into the deal-making process. Though Boehner couldn't get his caucus on record supporting a tax hike, his voter counters now have a much better idea of how many Republicans could get behind that approach. That's important because if Obama and Boehner strike a deal, he won't need to deliver all the votes himself. An Obama-blessed package will win support from House Democrats, who opposed Plan B. Most Republican insiders believe Boehner only has to deliver about half his members to keep his speakership. And even before Thursday's scuttled vote, Republican House Rules Committee Chairman David Dreier signaled that GOP leadership understood that Boehner's talks with the president were far from over. Obama echoed Dreier in a statement it released Thursday night vowing to "work with Congress to get this done and we are hopeful that we will be able to find a bipartisan solution quickly that protects the middle class and our economy." 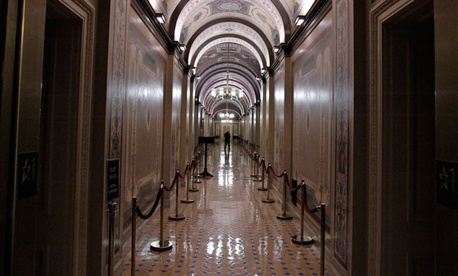 The failed vote creates space for Boehner and Obama to restart negotiations. Both the House and Senate aren't expected to take any more action on the cliff until after Christmas. With lawmakers back home and the nation tuned out for the holidays, Obama and Boehner could resume talks in a much less frenzied environment. In fact, some of the biggest breakthroughs in the negotiations so far have come after lawmakers have left town. Just last Friday, for example, Boehner offered to raise tax rates on millionaires. As then-Republican Senate Majority Leader Trent Lott used to say, the best time to cut a deal is when the Capitol is empty. Despite all the overheated rhetoric, Obama and Boehner aren’t that far apart on the actual numbers. On the question of how much new revenue the government should bring in through higher taxes, the two are separated by $200 billion in a multi-trillion dollar deal. On spending cuts, the two are again only $200 billion apart, not an unbridgeable gulf. The path to a deal remains. The only question is whether the speaker and the president can walk down it together. Billy House and Elahe Izadi contributed.